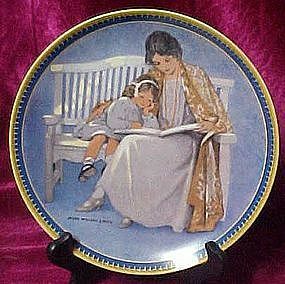 This lovely plate, "Mother's Day", is by the talented artist Jessie Willcox Smith and is the fifth issue in her "Childhood Holiday Memories" series from 1987. It depicts "our best-loved holidays as seen through the eyes and heart of a child." The artist was the most highly admired and paid female illustrator of her day and she created every cover of "Good Housekeeping" magazine from 1918 to 1932. What an amazing talent! This plate is in mint condition but has no box or paperwork. The plate measures 8-1/2" in diameter.